Two strong defensive teams, the Green Bay Packers and Tampa Bay Buccaneers, met on December 7, 1997 in Tampa with the NFC Central title on the line. The Packers, coached by Mike Holmgren, were the defending NFL Champions and had a 10-3 record thus far. QB Brett Favre (pictured at right) was the key to the offense and was helped by the presence of wide receivers Robert Brooks and Antonio Freeman as well as capable RB Dorsey Levens. Star DE Reggie White was hindered by back pain but overall, the defense was tough and aggressive. Tampa Bay was right behind the Packers at 9-4, having gotten off to a 5-0 start before losing three straight contests, starting with a defeat at Green Bay. No longer a perennial loser with the arrival of Head Coach Tony Dungy, the offense benefited from the presence of rookie RB Warrick Dunn, who teamed well with RB Mike Alstott in the conservative offense that was directed by QB Trent Dilfer. 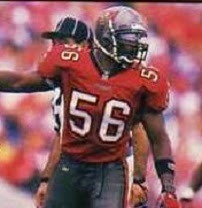 DT Warren Sapp anchored a solid defensive line and linebackers Hardy Nickerson and Derrick Brooks were outstanding. There were a franchise-record 73,523 fans in attendance at Houlihan’s Stadium on a clear afternoon. The Buccaneers had the opening possession and advanced into Green Bay territory as Trent Dilfer threw to WR Karl Williams for a 35-yard gain, but the drive stalled at the 39 and they punted. 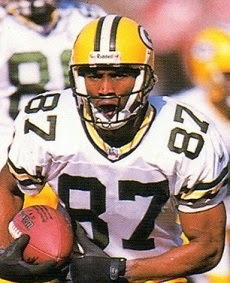 The Packers gave the ball right back on their first play when TE Mark Chmura fumbled when hit hard by SS John Lynch and CB Donnie Abraham after catching a short pass and LB Hardy Nickerson (pictured below) recovered at the Green Bay 13. Two carries by Mike Alstott picked up seven yards and the Bucs got on the board when Michael Husted kicked a 24-yard field goal. The Packers had to punt following a short series, but it was their turn to benefit from a turnover when Alstott fumbled the ball away at the Tampa Bay 36, FS Eugene Robinson recovering. A loss on a running play and false start penalty backed the visitors up, but Brett Favre, scrambling away from pressure, threw deep to Robert Brooks for a 43-yard touchdown. Ryan Longwell added the extra point and the Packers were in front by 7-3. The teams exchanged punts as the game headed into the second quarter. Tampa Bay got a break when Dorsey Levens fumbled and Abraham recovered at his 40, and while the Bucs lost ground and again had to punt, they got the ball back on yet another turnover when Lynch intercepted an overthrown Favre pass and returned it 28 yards to the Green Bay 30. The home team still wasn’t able to move the ball on offense, and Dilfer suffered a sprained ankle when sacked on third down by Reggie White, but they managed to not come up empty when Husted kicked a 48-yard field goal to narrow the score to 7-6. Taking over with 1:52 remaining in the first half, the Packers moved into Tampa Bay territory as Favre completed six straight passes, the longest to Antonio Freeman for 27 yards to the Bucs’ 14. But Longwell’s 31-yard field goal attempt was blocked by Nickerson and the tally remained unchanged at halftime. The teams traded punts to start the third quarter until the Packers put together a 10-play, 73-yard series. Favre again completed six passes, including one of 18 yards to Freeman to convert a third down and two to Chmura that picked up 20 and 10 yards to reach the Tampa Bay 15. Favre’s last completion was to Levens for an eight-yard touchdown and, with Longwell’s point after, Green Bay was ahead by 14-6. The Buccaneers advanced methodically to the Green Bay 47, but once again a third down sack, this time by Robinson, forced another punt. As the game entered the final period, the Packers put together a long possession that covered 88 yards in 16 plays and used up over ten minutes of playing time. Levens started the drive off with runs of 17 and 15 yards and Favre completed five passes. Longwell kicked a 27-yard field goal and Green Bay’s lead was up to 11 points with 6:24 to play. With Dilfer finally forced from the game by his injured ankle, Steve Walsh was at quarterback when the Buccaneers got the ball back, and he converted a third-and-12 situation with a completion to Williams (pictured below) that picked up 38 yards to the Green Bay 36. But three plays later, an interception snuffed out the threat. Tampa Bay got one last shot with the clock down to 2:37 following a punt by the Packers, but three passes netted nine yards and an incompletion on fourth down effectively ended the game. Green Bay came away the winner by a final score of 17-6. The Packers generated far more offense than the Buccaneers, reflected in their lead in total yards (362 to 161) and first downs (20 to 8). While Green Bay was held to 82 yards on the ground, Tampa Bay’s normally robust running game was held to 67. The Packers had more turnovers, with three to the Bucs’ two, but theirs all came in the first half and Green Bay also recorded all of the game’s four sacks. Brett Favre completed 25 of 33 passes for 280 yards and two touchdowns, giving up one interception. Dorsey Levens rushed for 54 yards on 22 carries but also led the Packers in pass receptions with 8, good for 64 yards and a TD. Antonio Freeman gained 73 yards on 5 catches and Robert Brooks (pictured below) was right behind with 71 yards on his three receptions that included a score. For the Buccaneers, Trent Dilfer was successful on just 6 of 17 throws for 67 yards and no TDs, although also no interceptions. Steve Walsh was four-of-nine for 50 yards and was picked off once. 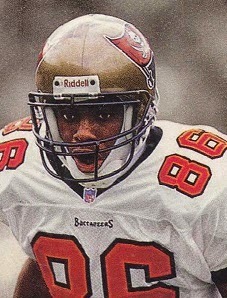 Karl Williams caught 5 passes for 87 yards, by far the biggest performance of any of the Tampa Bay receivers, while Mike Alstott gained just 34 yards on 10 carries and Warrick Dunn was held to 33 yards on 12 attempts. “In my 43 years, I’m not sure I’ve been around a better effort than the one today,” said Green Bay defensive coordinator Fritz Shurmur regarding his unit’s performance. The win clinched a third straight NFC Central title for the Packers, who ended the regular season with a 13-3 record. Tampa Bay placed second at 10-6, the franchise’s best record since 1979, and qualified for the playoffs as a Wild Card. A win over Detroit in the first round set up another meeting for the Buccaneers with the Packers at the Divisional level, and for a third time they lost to Green Bay. The Packers went on to win the NFC Championship, losing a close contest to Denver in the Super Bowl. Brett Favre led the NFL in touchdown passes (35) and the NFC in passing yards (3867). He was Associated Press MVP, consensus first-team All-NFL, and a Pro Bowl selection for the third consecutive year. Dorsey Levens was also named to the Pro Bowl as he placed second in NFC rushing with 1435 yards, in addition to catching 53 passes for another 370 yards and scoring a career-high 12 touchdowns.